1883, Jun Sank near John's Island, Georgian Bay. 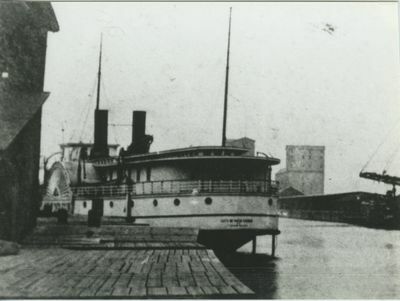 1886 Raised; repaired Owen Sound. 1899 Owned Cook Brothers Lumber Co; ran Sault Ste. Marie route. 1900, Jun 14 Owned T.M. Kirkwood, Toronto, ONT; rebuilt by John Burgess at Owen Sound as passenger & freight steamer, capacity 250 passengers; renamed CITY OF OWEN SOUND, 754 gross tons. 1902 Owned Algoma Navigation Co, Ltd.
1906 Renamed ERINDALE, 3 decks, 129.03 x 24.3 x 10.6', 444.02 net tons. 1906, Aug 10 Burned Bowmanville, ONT.